Turns out that AmigaOS 4.1 FE (Final Edition) is being shipped out to various Amiga shops as we speak. Please read the full press release from Hyperion Entertainment below. 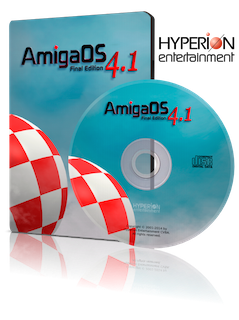 Hyperion Entertainment is thrilled to announce shipment of AmigaOS 4.1 Final Edition to dealers has been started. This means that the first customers will get their own copy of AmigaOS 4.1 Final Edition right before christmas, just in time to put it underneath the christmas tree. Since the initial release of AmigaOS 4.1 more than six years ago, functionality and user experience have been steadily improved by six free major updates and over 88 free smaller ones through AmiUpdate. AmigaOS 4.1 Final Edition defines the new baseline by consolidating all previous updates, bringing new long awaited features and stability improvements and last but not least enabling the user to make a clean installation in one go. Additionally it comes professionally produced as full version on physical media in a nice DVD box, together with a booklet containing installation instruction as well as a little extra for only EUR 29.95 suggested retail price (incl. VAT, may very on your location). Customers can find a list of possible dealers at http://www.amigaos.net/content/4/where-buy. Interested dealers can register themselves and order AmigaOS by writing to orders@hyperion-entertainment.biz . Hyperion Entertainment and the whole team behind AmigaOS wish a merry christmas, happy new year and lots of fun with AmigaOS 4.1 Final Edition! The fact that it can be ran on an emulator (the version for Amiga 1200/3000/4000 can run on an emulator, not the others as far as I know) will probably increase the sales, especially considering the lower and more affordable price of the OS. Will be interesting to read the responses to this on the various discussion forums. Hope you all are well and that you are on track with your Christmas gifts. 😉 I know I’m not.. hehe..
UPDATE: Please remember that you need a PPC accelerator card for your Amiga 1200, 3000 or 4000 to run the classic version.